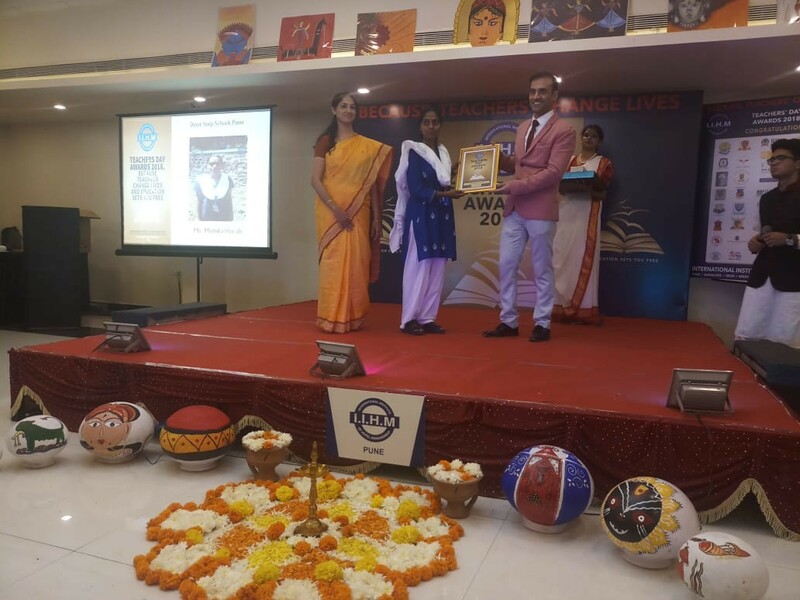 After Rajani tai's felicitation for the Teacher Warrior award, we have one of our teacher's, Ms. Monika Hiwale who received the IIHM Teachers Day Award. Every year International Institute of Hotel Management (IIHM) felicitates teachers on occasion of Teachers' Day on September 5. This is a unique initiative by IIHM in association with the International Hospitality Council, London & Delhi. Educators across the country look forward to this event as valuable contributions towards improvement of the education sector, are appreciated through this initiative.This year, Ms. Monika Hiwale from Door Step School, Pune was awarded the IIHM Teachers Day Award. Ms. Monika joined DSS in May 2007 as a Teacher. Currently she is responsible for our Janta Vasahat Community Learning Center on Senapati Bapat road and manages a class of 30 students. Her strengths include detailed planning, regularity, punctuality and her willingness to learn new things and impart knowledge to her students. Owing to these qualities, she has been given more responsibilities of taking life skill sessions, conducting Science experiments and helping children with their Scholarship studies. She is a very warm person with a great rapport with students as well as team mates. Heartiest congratulations to Ms. Hiwale for bagging this excellence award!